Today was one of those days that you just need to get out of the house – at least I did. It was sunny and in the 40s in January and that was enough to get me out of my pajamas on a lazy day. Enough of this recuperating. Heading west on Route 66 seemed easy enough – follow the Mother Road the way we used to when I was a kid, before the turnpike sped us along. I’d been wanting to go to the Rock Cafe in Stroud. I’d seen it on Diners, Drive-Ins and Dives with Guy Fieri, heard about it, read about the fire and the rebuilding and the original grill and its influence on the movie “Cars.” I also knew it was up for sale and figured I’d better see it soon – who knows what will happen. 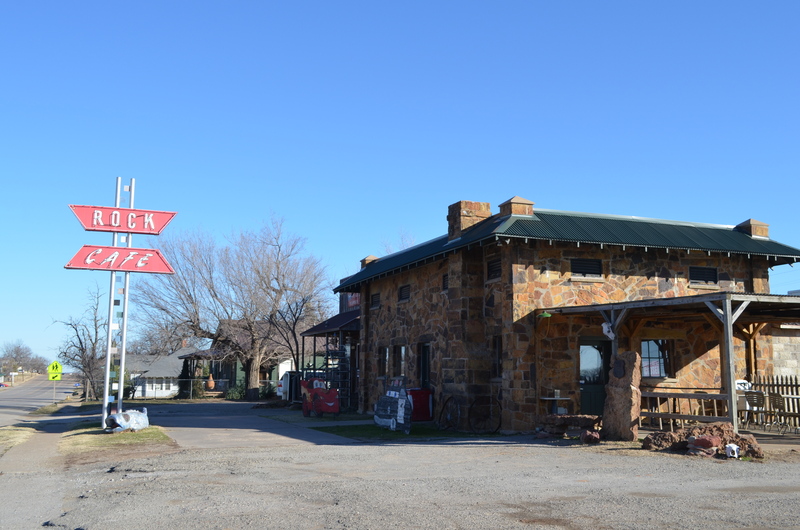 If you take Route 66, you look for the signs of the old 66, the little concrete road that runs parallel to the newer road, and imagine what it must have been like to drive when it first opened. It’s narrow, hard to imagine what you did when you met another car coming at you. They didn’t go very fast, compared to today, but Americans drove across the country, passing through Oklahoma on their way from Chicago to Los Angeles. It was definitely an adventure in those days. My family used to drive it almost every week, heading to Oklahoma City to see my grandparents, uncles, aunts, cousins. I mostly remember driving back at night in the dark, sleeping on the floor of the car, listening to the radio. The turnpike was a godsend for those of us who made the trip often, but I realize what it did to the little towns. Anyway, today I looked for remnants of what it must have looked like, traveling along that concrete road. We saw a few of the old, old motels…amazingly some are still in use. By the time my friend and I were in Stroud, it was almost three in the afternoon. There were no cars at the Rock Cafe and we went in for a late, late lunch. To my horror, after we ordered, I remembered they close at three. They were waiting to leave when we got there, but they didn’t admit it or turn us away. I’ll give them credit for that, because the service was begrudging and the food was no more than mediocre. I can also imagine it’s more interesting with more customers. I will say the bathrooms are interesting – every inch of the rooms covered in graffiti, even the toilet seats. They’re clean…just covered with messages from folks who’ve stopped by. So check off another place on my never-ending list of places I’d like to see. Not every adventure has to be perfect. It’s the going that counts. I’m gone to convey my little brother, that he should also visit this website on regular basis to take updated from latest information. Thank you very much! I hope he enjoys it!